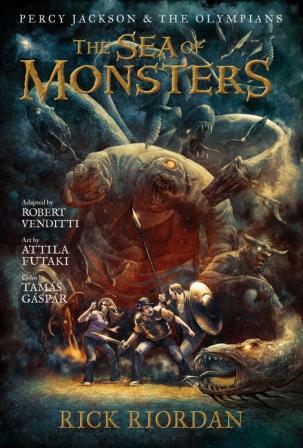 Written by me, and with art by Attila Futaki and colors by Tamás Gáspár, the book is slated for release in early 2013. Attila just finished penciling the scene where Percy and Annabeth encounter the Sirens, and he did an amazing job as usual. The Sirens didn’t make it onto the cover, but many of Greek mythology’s other iconic monsters did. Can you name them all? I think your GNs are so amazing and they are a perfect way to quickly reread the Percy Jackson series (since I am obsessed). I like to draw and write comic books, and since the quality of your GNs are so amazing, I always look back at them for help! Super excited and can’t wait for the Battle of the Labyrinth to come out!!! -just wanted to give some kind words and support!! Thanks so much for the kind words, Eliza. I’m glad you’re enjoying the books! When the 4th Percy Jackson will be out? 2018? You working on the 5th, I get it. Tell Orpheus Collar nice talent for complete The Kane Chronicles graphic novel trilogy as well as the heroes of Olympic with your adaptation. I don’t know the release date. Hyperion will announce it when they decide, so you can check with them. Glad you enjoyed Orpheus’s work. He’s great!